Kids still conveniently small? Then perhaps you should consider a fun alternative to the traditional hatchback while you still can: BMW’s 2 Series. The 2 is based on BMW’s 1 Series hatch. Obviously it’s a coupé, but don’t run off with the idea that it’s useless for four passengers. It's surprisingly practical for a two-door. As a bonus, it looks great inside and out. What else does the 2 Series have going for it? Well, for a start it’s a brilliant drive, with accurate, light steering and the sort of precision through corners that will bring a broad smile to your face. Even horrible old British roads won't disturb its easy going nature. Coupés might not be the first choice for those interested in rear-seat comfort, but the back of the 2 is perfectly adequate for shorter trips. There’s no compromise on front space, and that goes for the boot too: it’s roomy for the class. Under the bonnet you can pick from a range of six engines: three petrols and three diesels. We’d recommend the 220d. With 188bhp, the performance is approaching hot-hatch levels. Of the petrols, the headline M235i model’s 3.0-litre straight six is a peach. When BMW first brought out its iDrive infotainment system it was panned by most experts. Evolution has brought big improvements. The infotainment and sat-nav software that’s now standard across the range is brilliantly easy to use with intuitive controls and layout and crisp graphics. It’s probably the best of its kind. BMW also used to be known for poor equipment levels, but once again that’s all changed. There are four 2 Series trim levels but the standard SE specification will satisfy the great majority of buyers, providing sat-nav, rear parking sensors and 17in alloy wheels. 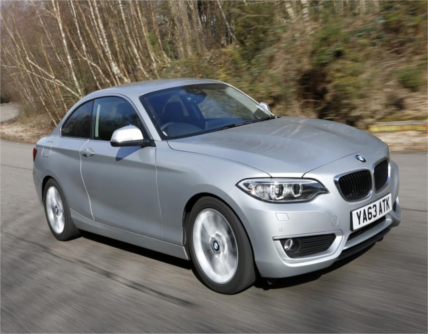 Buying a used 2 Series at a bargain price won’t be easy as it’s only been around for two years. You’ll need to find something in the order of £15,500 for the lowest-priced petrol models. Our favourite 220d diesels don’t demand much of a premium, just £500 or so, but don’t go for a diesel if your motoring life is all about short trips in the city as the Diesel Particulate Filter (DPF) may well become terminally clogged – and replacements are not cheap. Ensure that all of the electronics work OK, especially the infotainment package.